A very exciting month approaches for all who fish in Maryland. October will see falling water temperatures and fish will be very active as they sense the change and prepare to fatten up for the winter months ahead. I will be absent from the fishing reports for the next two weeks as I spend some time chasing elk in the Rocky Mountains of New Mexico. Erik Zlokovitz has stepped up to the plate and I'm sure he will bring you the latest in fishing opportunities as we step into October. At the very top of the Chesapeake Bay from Pooles Island north to the mouth of the Susquehanna and Elk Rivers an influx of legal-sized striped bass are moving into the area. Water temperatures have dropped to the 76° mark and there is developing early morning and evening topwater action in the shallower areas on the Susquehanna Flats and surrounding areas. The Conowingo Dam has been releasing very little water for the last few weeks so water clarity is very good. Much of the striped bass fishing effort in the upper bay has switched to jigging, trolling and live lining spot. Schools of striped bass which tend to be sub-legal in size mixed with a few bluefish are chasing bait to the surface throughout the region so casting to the surface action or jigging deeper has been very popular. Legal-sized sea trout have recently been a welcomed surprise for those jigging in the upper bay. Those choosing to troll are pulling small Drone spoons, bucktails and surge tube lures ("hoses") behind planers and inline weights near channel edges or near concentrations of breaking fish. Live liners have been able to obtain a good supply of spot and are working the channel edges wherever suspended fish can be spotted on depth finders. The channel edge from Sandy Point Light north to above the mouth of the Magothy River, Brewerton Channel and the Bay Bridge piers have been good places to check for fish lately. In the middle bay region, breaking fish composed of a mix of sub-legal and legal-sized striped bass, bluefish and the last of the Spanish mackerel are working over schools of bay anchovies throughout the region. The channel edges on both sides of the bay, Eastern Bay and the mouths of the region's tidal rivers have been providing a lot of action. Many of the striped bass are sub-legal but there are legal fish being caught, especially by jigging along with sea trout. Trolling has been popular and live lining spot is a very good way to target a better grade of striped bass wherever they can be found suspended along channel edges. The shallow water striped bass fishery is quickly improving with cooler water temperatures. 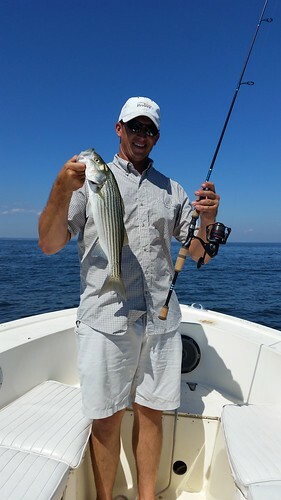 Brad Foxwell holds up a nice striped bass he caught off of Chesapeake Beach. Courtesy of Bill Dickerson Fishing for white perch in the lower sections of the upper bay and middle bay's tidal rivers has been very good in the deeper areas over hard bottom. Bloodworms have been the preferred bait but jigging with dropper flies is also a good way to catch a mess of white perch. Lower water temperatures are welcoming white perch to move into areas of shallow shoreline structure which opens the door for light tackle fishing with small spinners and jigs. Lower bay fishermen are enjoying good fishing on a mix of bluefish, Spanish mackerel and striped bass that are working over schools of bay anchovies throughout the region. There is plenty of fun surface action along with jigging. The topwater action tends to comprise bluefish, Spanish mackerel and sub-legal striped bass. Jigging down deep has been offering better chances at larger striped bass with the bonus of sea trout and once in a while a screaming drag that signals the run of a large red drum. Trolling has been productive and most are pulling small Drone spoons, surge tube lures and bucktails behind planers and inline weights. It also pays to have at least one large spoon out in the trolling spread for a possible cobia or large red drum that are still in the region. The greatest concentration of large red drum and cobia has been at the Middle Grounds and cooler water temperatures are signaling them to start moving south with the Spanish mackerel. Bottom fishing for large spot has been very good in the lower Patuxent River and good over in the Tangier and Pocomoke Sound areas. On the eastern side of the bay there is also a mix of speckled sea trout, kingfish and gray sea trout being part of the bottom fishing mix. White perch fishing has also been very good in the region's tidal rivers. Recreational crabbing continues to be good this week and those out on the water at dawn are noticing the crowds are thinning out. 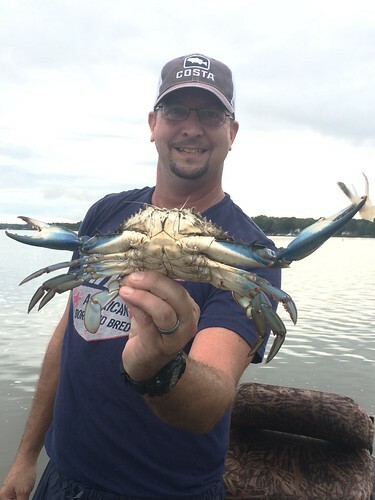 This is the best time of the year to catch a bushel of heavy crabs and those who make the effort can start to pick crabs to put away in the form of crab cakes and picked crab meat for the coming winter months. This heavy whopper will make for some fine eating. Photo courtesy of John T. McMullen Before we get in to the freshwater fishing action, here is another update on Bay water conditions (salinity and temperature) from the DNR water quality monitoring team. 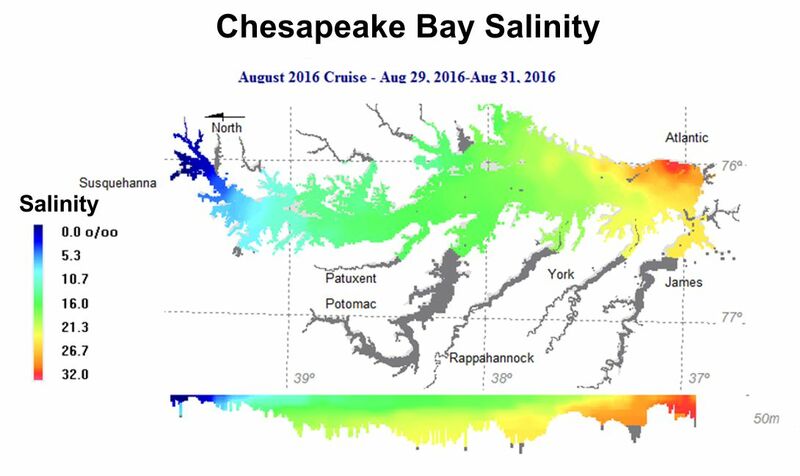 Elevated Bay Salinities - Maryland's portion of the Chesapeake Bay continues to show higher than average salinities (Orange squares). This allows fish typically only found in the higher salinity areas of the lower Bay (such as Spanish mackerel and bluefish) to move farther into Maryland waters. Heavy rains are predicted over the next several days and may result in decreasing salinities. For more info on Bay conditions see eyesonthebay.dnr.maryland.gov/eyesonthebay/currentconditions.cfm. Cooling Bay Water Temperatures - Chesapeake Bay water temperatures continue to cool across Maryland waters. Real-time Chesapeake Bay surface water temperatures are available at NOAA's buoybay.noaa.gov. 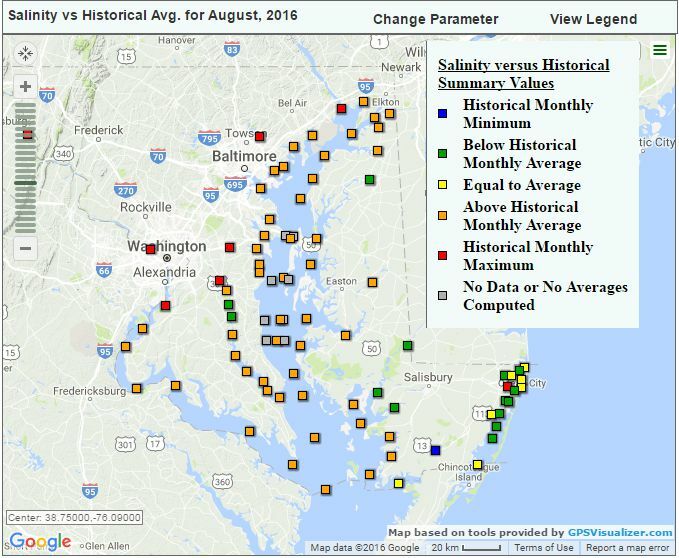 Note: Data for the map is collected by both Maryland and Virginia monitoring teams and funded by both States and EPA's Chesapeake Bay Program. August Salinites-2016 Freshwater fishing is beginning to transition out of the lazy summer mode of fish behavior as water temperatures steadily fall to more comfortable levels for all species of fish. Water levels in most streams and rivers are rather low this week but today's rain storms and those that follow will do much to lower water temperatures further and bring water levels up. The upper Potomac River water levels for example has been running very low and clear and are about 75° prior to today's rain. Deep Creek Lake is experiencing significant draw down and lake levels are down about 3' and disrupting largemouth and smallmouth bass fishing near shallower structure. Floating docks and deeper structure have been the best places to target with whacky-rigged stick worms or soft plastics. The tidal rivers are offering good largemouth bass fishing this week. The Eastern Shore rivers and the tidal Potomac are providing good topwater action in the mornings and evenings. A falling tide makes for near perfect conditions over grass or on the outside edges of grass beds and spatterdock fields. Northern snakeheads will also be part of the action in many tidal rivers as they continue to expand their range. Spinnerbaits and small crankbaits are good choices also for working the outside edges. Whacky-rigged stick baits and soft plastics are a good choice for working sunken wood or similar structure in deeper waters. 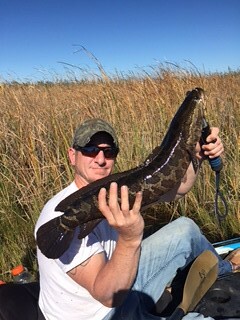 This big northern snakehead came from the waters near Blackwater in Dorchester County. Photo courtesy of Ernest Goff Fishing for channel catfish in the tidal rivers is starting to improve with cooler water temperatures. Soon blue crabs will begin to move down the rivers and there will be less interference with baits fishing close to the bottom. Fishing for blue catfish in the tidal Potomac continues to be a good choice for anyone wishing to stock up a freezer with mild fish fillets. Fishing for bluegills is also a good option for anyone looking for some fun action in the many lakes and ponds that dot the Maryland landscape. A simple worm or cricket under a bobber is a good choice or small lures for spinning gear as well as rubber-legged poppers for fly fishing. At the Ocean City area the summer tourist crowds are thinning and the fishing is improving on all fronts. Surf fishing continues to focus on a mix of small summer species but those casting larger baits are catching and releasing large red drum and also catching some medium-sized black drum and bluefish. At the Inlet and Route 50 Bridge area flounder fishing has been very good, especially near the South Jetty; sheepshead, medium-sized black drum and triggerfish are being caught on sand fleas. The channel areas leading to the inlet area are providing very good flounder fishing as cooler water temperatures begin to tickle flounder into considering migrating out the inlet for offshore waters. Gulp baits and live spot have been accounting for the largest flounder. Outside the inlet there has been some excellent flounder fishing on the inshore shoal areas as well as the wreck and reef sites. A mix of triggerfish, sea bass and northern blowfish are also being caught depending on baits used. At the canyons fishing for white marlin has been very good with multiple catch and release numbers being common. Some exceptional gaffer size dolphin and large yellowfin tuna are being caught at the various canyons along with a few wahoo.